Sometimes I find it difficult to live in Ottawa as a film fan. All the quality indie theaters I love show films far too late or on days where I’m juggling other responsibilities and can not make it out see ’em. In contrast, I live within walking distance to a multiplex, but they seem far more interesting in promoting Beastly than anything else. No thanks. Yes! 35mm prints of two John Woo/Chow Yun-fat collaborations are definitely a positive thing. It’s playing on April 12th. I’ll be there. Not a bad excuse to blog about two masterpieces, right? Another film of interest is being shown on April 1st when the Mayfair plays Enzo G. Castellari’s Keoma. I can’t say I’ve seen it, but I have heard nothing but good things about it. I’m sad to announce that I’ll be out of town when they are showing a print of Once Upon a Time in China II, but you can’t win them all right? I encourage anyone from Ottawa to make it out to see it on Friday. Before I leave town for the weekend, I did manage to find one theater that is showing The Butcher, The Chef, and the Swordsmen, but that’s a 20 minute drive out of town to get there. Ouch. The only day I’d be able to see it would be tomorrow. Should I attempt the drive? Or pass? 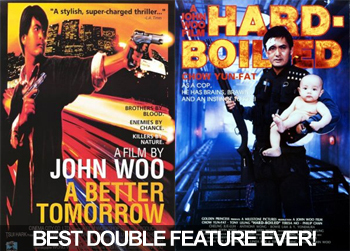 This entry was posted on Tuesday, March 22nd, 2011 at 9:36 pm and is filed under a better tomorrow, chow-yun fat, enzo g. castellari, hard boiled, hong kong, john woo, once upon a time in china, the butcher the chef and the swordsman. You can follow any responses to this entry through the RSS 2.0 feed. You can leave a response, or trackback from your own site. Awesome double feature, is there a reason they are showing them? Keoma is absolutely worth seeing, I’d love the chance to see it in a cinema! Shame you can’t make Ouatic II, I have seen that theatrically and it was great. I’m jealous that you were able to see it. Who knows if it’ll ever come back! I sadly didn’t get a chance to see Keoma either. Ah well.